Will September be Decisive for the Nuclear Agreement? Two frustrating years out of ten have passed since the nuclear agreement was signed. The world is stepping into the third year of an agreement described by US President Donald Trump as the worst in ages. It is obvious that September will be decisive for the nuclear agreement as the US administration is considering a comprehensive strategy for all noxious Iranian acts – a strategy that calls for more strictness against Iranian forces and its agents of extremist Shi’ite groups in Iraq and Syria. Through its new strategy, Washington aims to increase pressure on Tehran to curb its ballistic missiles program and its support to extremists. It also targets cyber-spying and possibly, nuclear proliferation. According to Reuters, the new US strategy “could be agreed and made public before the end of September.” Once agreement is reached on this comprehensive strategy, then we will face a new phase of a serious attempt to downsize Iranian expansion after it lasted eight years (during the term of Obama) and, ironically, reached its zenith after signing the nuclear agreement. Most importantly, the strategy will be the first practical step by Trump’s administration towards a stricter supervision of the nuclear agreement without letting it be an advantageous award to Tehran’s arms and militias in the region. The real catastrophe is that Iran has already received all it had to gain from the nuclear deal, which serves its interest and doesn’t terminate uranium enrichment. Nikki Haley, US ambassador to the United Nations, said it is likely that Iran has already accumulated enough reactors to produce a nuclear bomb. The problem with the agreement was and still is that it does not stand against Iran’s aspirations to expand aggressively in the region. Furthermore, it does not effectively tackle Iran’s previous efforts for nuclear armament at a time when it still continued to the violate the agreement. The truth is, no one opposes a nuclear agreement that falls in the interest of the world. No one wishes to besiege Iran as long as it doesn’t violate international laws. It is in no one’s interest to call for abolishing the agreement, but the concerns that appeared when announcing the agreement in July 2015 seemed obvious after the deal was signed. In short, Iran had violated the agreement in the first month and it continued to manipulate it under the pretext of “the spirit of the agreement”. But in fact it has been violating central details without being held accountable. For example, the agreement stipulates that Iran be notified if it violates any of the articles, and in case it abides by it again later on then this wouldn’t be considered a breach. 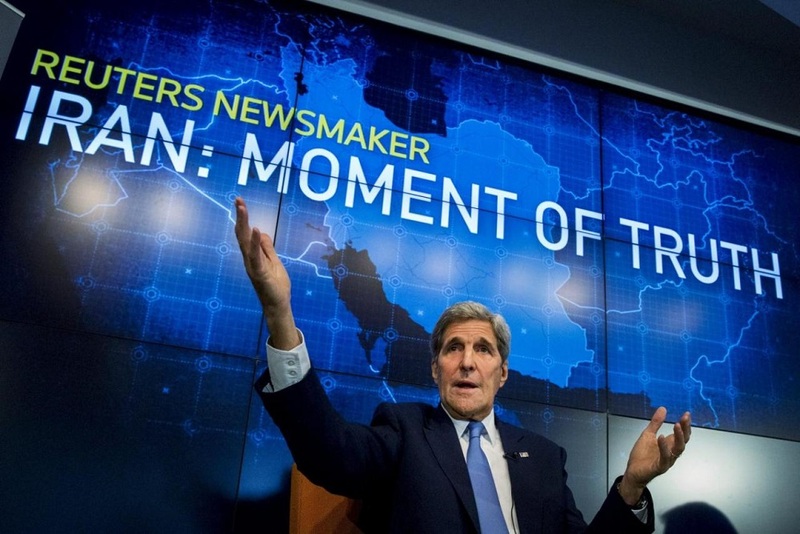 In this way, Iran continues to violate the agreement, and then it stops when being notified. I think that this is the best agreement Iran has ever signed because it is benefiting from it in any way it wants, while the region is jeopardized by Iran’s use of its terrorist networks under the umbrella of the international agreement. We can say that this is the first article that should be revised strictly so that Iran becomes aware of the consequences of its violations. Who would believe that the US navy can’t strongly respond when IRGC-affiliated armed ships provoke it (a thing that occurred several times in the past two years)? The desire not to give Iran an excuse to disrupt the nuclear agreement is the only thing stopping them. What better gift could be given to Iran? In his famous interview with Atlantic magazine in 2015, Obama said that the long negotiations with the Iranians that led to the agreement would help restore respect to Iran and calm in the region. He pointed out that he has no excessive concerns over Iran’s corruption and that supporting the US allies against Tehran would trigger conflicts. Two years of the agreement have proven that everything Obama said and believed in, and everyone who supported the agreement, was wrong. The region didn’t calm down, but the opposite. The agreement didn’t help Tehran respect its neighbors. The only thing that happened is that ignoring Tehran’s attitude led to an escalating threat to the world, not only the region. Maybe it is time to call Iran to account for violating the nuclear agreement, even after two years of signing it.